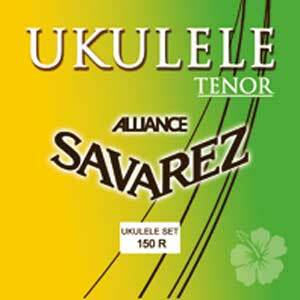 Savarez ukulele strings for tenor ukulele. Approximately 32" in length. They are made of ALLIANCE KF composite fibers which represents a big advantage, improving the sound of the instrument and enhancing its colored personality. The customer service I received was truly outstanding. I will get all of my strings from this company from here on out. I haven't installed the strings, but I read very good reviews, so I'm confident about my purchase. The shipping was fast and the price even better in comparison with others. If you've ever use Savarez's classical guitar strings, you know how good their strings are. Warm and mellow with a really soft feel. They didn't work on my Córdoba acoustic/electric, but really sing on my solid mahogany Pono.